The Italian scientist Galileo is famous for his contributions to astronomy, physics (the science that deals with matter and energy), and scientific thought. Galileo Galilei was born in Pisa, Italy, on February 15, 1564, the first child of Vincenzio Galilei, a merchant and a musician, and Giulia Ammannati. The family moved to Florence, Italy, in 1574. That year Galileo started his formal education in the nearby monastery (house for people who have taken religious vows) of Vallombrosa. Seven years later he studied medicine at the University of Pisa. In 1583 Galileo developed new interests and began his studies in mathematics and physics, which ended his medical studies. In Pisa at that time there was only one notable science teacher, Francisco Buonamico, who taught the ideas of Aristotle (c. 384–c. 322 B.C.E. ). Galileo seems to have been an eager follower of Buonamico, as shown by Galileo's Juvenilia, dating from 1584, which mostly describes Aristotle's scientific ideas. Because of financial difficulties, Galileo had to leave the University of Pisa in 1585 before earning his degree. Back in Florence, Galileo searched for a teaching position and continued to study mathematics and physics. He published two works that made his name well known. One was The Little Balance, describing the hydrostatic (relating to the forces produced by fluids at rest) principles of balancing; the other was a study of the center of gravity of various solids. His rising reputation gained him a teaching post at the University of Pisa in 1589. Galileo had to support his mother, brothers, and sisters after his father's death in 1591, so he found a better position in 1592 at the University of Padua, part of the Venetian Republic. In 1604 Galileo declared that he was a supporter of the theory of Nicolaus Copernicus (1473–1543), who stated that the earth and other planets revolved around the sun. In 1606 the publication of The Operations of the Geometrical and Military Compass, revealed Galileo's skill with experiments. In this booklet he also defended himself against criticism from several sources. In mid-1609 Galileo learned about the success of some Dutch eyeglass makers when they combined several lenses into what later would be called a telescope (an instrument for viewing distant objects). He went right to work, and on August 25 he presented to the Venetian Senate a telescope as his own invention. This led the University of Padua to give him a lifetime contract, but resentment followed when it was learned that Galileo was not the original inventor. Galileo's telescope had a magnifying power of about forty. Sometime in the fall of 1609 he turned the telescope toward the sky. Within a few months Galileo had gathered astonishing evidence about mountains on the moon, about moons circling the planet Jupiter, and about an incredibly large number of stars. In March of 1610 all these sensational items were printed in Venice, Italy, under the title The Starry Messenger, a booklet that took the world of science by storm. The view of the heavens changed greatly, and so did Galileo's life. 1650) of the University of Ingolstadt, Germany, whose observations of sunspots had already been published in 1612. Galileo's real aim was to publish a complete description of the universe and of the new physics it required. A major problem was that many people believed that, according to the Bible, the sun and other planets moved around a motionless earth. With the help of some religious experts, Galileo produced essays explaining and defending his point of view in the form of letters, which ranked among the best religious writings of those times. As the letters circulated widely, a showdown with Church authorities seemed certain. In 1616 the Church ordered Galileo not to "hold, teach, and defend in any manner whatsoever, in words or in print" the theory of Copernicus regarding the motion of the Earth. Galileo obeyed the order partly to make life easier for himself and partly because he remained a devoted Catholic. In 1624, though, after meeting with Pope Urban VIII (1568–1644) and sensing that anger over his writings had lessened, Galileo decided to pursue his work again. Galileo spent six years writing his Dialogue Concerning the Two Chief World Systems. Published in 1632, it contains criticism of the supposed perfection of the universe as claimed by Aristotle. It discusses how the rotation of the earth helps explain different occurrences in space. The orbital motion of the earth around the sun is also debated. The Dialogue was a huge success. The fact that some of his ideas opposed each other did not take away from the popularity of the work. The Dialogue proved that Galileo held, taught, and defended the theories of Copernicus, so he was called back to Rome to appear before Church leaders. The proceedings lasted from the fall of 1632 to the summer of 1633. During that time Galileo was allowed to stay at the home of the Florentine representative to Rome. He was never subjected to physical threats. However, he was finally ordered to publicly renounce (state that he did not believe) the idea that the Earth moved. Galileo was then confined under house arrest to his home in Arcetri, Italy. He was not allowed to have any visitors nor have any of his works printed outside of Italy. Both orders were ignored. In 1634 a French translation of one of his old papers on mechanics (the study of forces and their effect on matter) was published, and in Holland the Dialogue was published in Latin in 1635. 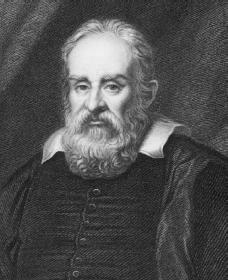 In 1638 Galileo's Two New Sciences was printed in Leiden, Holland. It gave a geometrical (relating to points, lines, angles, and surfaces) description of motion, partly because such an approach led to a close match with known data. Galileo believed that the universe was structured along the patterns of geometry, the product of a Creator who had planned everything according to weight, measure, and number. This religious belief is possibly Galileo's greatest quality. It was best stated in the Dialogue, when he described the human mind as being the most excellent product of the Creator because it could recognize mathematical truths. Galileo spent his last years partially blind. He died on January 8, 1642. Drake, Stillman. Galileo at Work: His Scientific Biography. Chicago: University of Chicago Press, 1978. Reprint, New York: Dover Publications, 1995. Fisher, Leonard Everett. Galileo. New York: Atheneum, 1992. Hightower, Paul W. Galileo: Astronomer and Physicist. Springfield, NJ: Enslow, 1997. Redondi, Pietro. Galileo Heretic. Princeton, NJ: Princeton University Press, 1987. Reston, James. Galileo: A Life. New York: HarperCollins, 1994. GALILEO proved that the Earth and the other planets revolved around the sun ( not that the sun and other planets revolved around a motionless Earth.) When he trained the telescope on the heavens, he noticed that the planets appeared larger or smaller, depending upon what time of the year they were viewed. He reasoned that this could only be so if the distance from the Earth to the planets was decreasing or increasing because they were in orbit about the sun. Because if all the planets and the sun were orbiting around the Earth, their apparent size would be about the same, regardless of what time of the year the observation was made. I believe that GALILEO was one of the greatest scientists of all time. GALILEO proved that the Earth and the other planets revolved around the sun ( not that the sun and other planets revolved around a motionless Earth.) When he trained the telescope on the heavens, he noticed that the planets appeared larger or smaller, depending upon what time of the year they were viewed. He reasoned that this could only be so if the distance from the Earth to the planets was decreasing or increasing because they were in orbit about the sun. Because if all the planets and the sun were orbiting around the Earth, their apparent size would be about the same, regardless of what time of the year the observation was made.I believe that GALILEO was one of the greatest scientists of all time.